The program starts in Medan where we fetch you from Kuala Namu airport. From Singapore or Kuala Lumpur it is a one hour flight to Medan. If there is time you can make an architectural citytour through Medan. Overnight in Hotel Deli River in a tropical garden. The next day you will see the orang utans in their natural environment and get information from your guide about the fauna and flora of Gunung Leuser National Park. Permit and entrance fees are included in this tour. Orang utans in the jungle, overnight in a tropical garden. The program starts in Medan where we fetch you from Kuala Namu airport. From Singapore or Kuala Lumpur it is a one hour flight to Medan. If there is time you can make an architectural citytour through Medan. Overnight in Hotel Deli River in a tropical garden. The next day you will see the orang utans in their natural environment and get information from your guide about the fauna and flora of Gunung Leuser National Park. Permit and entrance fees are included in this tour. Arrive at Kuala Namo airport of Medan with … …(please advise us your flight number and arrival time). We will fetch you from the airport and transfer to Hotel Deli River in a tropical garden. If there is enough time you can make a city tour of Medan taking in the remaining original Dutch, English, Chinese and Malay architecture for 3 hours. In the afternoon you go back to Hotel Deli River. 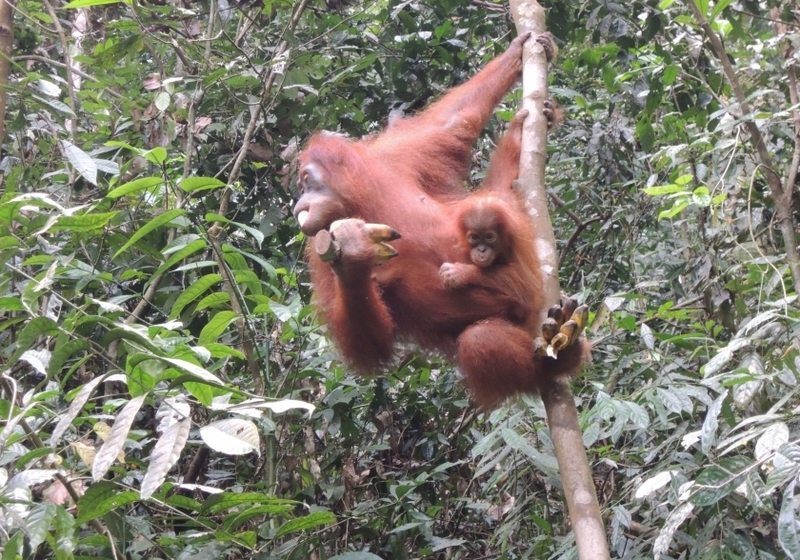 Medan – Bukit Lawang (3,5 hours drive). In the morning depart to Bohorok/Bukit Lawang, the orang utan rehabilitation centre via many rubber and palmoil plantations. It takes around 3 ½ hours driving from Medan to Bohorok/Bukit Lawang, part of Gunung Leuser nature reservation in North Sumatra province. After lunch (optional) you start for 3 hours jungle trekking with an experienced local guide in the tropical primary rainforest to see orang utans, Siamang (long arm apes), Thomas Leave Monkeys, long tail macaque and varieties of birds and others wildlife. In the afternoon you return to Bohorok. Overnight stay in Bukit Lawang. Your accommodation in Bukit Lawang is located on the banks of Bohorok river. Today we will transfer you to your hotel in Medan or to the airport to catch your flight the next destination. End of our services. 2 to 3 persons is US$ 250 -per person. 4 to 6 persons is US$ 225 -per person.